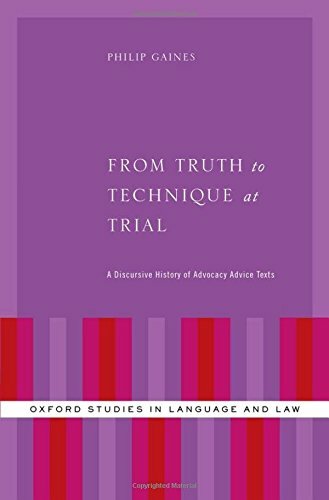 From Truth to Technique addresses key questions raised by the burgeoning literature in what Philip Gaines calls advocacy advice texts-manuals, handbooks, and other how-to guides-written by lawyers for lawyers, both practicing and aspiring, to help them be as effective as possible in trial advocacy. In these texts, advice authors share principles, strategies, and techniques for persuading juries and winning cases. Some manuals even form the basis for required advocacy courses in law schools. Unlike training manuals in other professional domains-sales, leadership, management, fundraising, coaching, etc.-advocacy advice texts offer guidance for effectiveness in a realm of activity where the stakes may be the very highest for the parties and where society has an abiding interest in the truth being discovered and justice being done. Helping advocates learn how to win cases may be the ultimate purpose of advice texts, but to what extent are ideas about the values of truth and justice-what Gaines calls metavalues-incorporated into discussions about winning tactics and techniques? To explore this question, Gaines takes the reader through a discursive history of the relation between technique and metavalues as presented in advocacy advice-beginning with a thematic analysis of the first texts published in the Anglo-American tradition in the early 17th century, through treatises written during seasons of radical change in the profession in the 18th and 19th centuries, and up to the present day with a look at the more than 200 trial manuals currently in print. This diacronic study reveals dramatic changes in the place authors give to the metavalues of truth and justice when lawyers advise other lawyers about how to be effective in the courtroom.